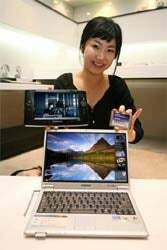 Over on sister site Digital World Tokyo, Martyn Williams writes that Samsung will be launching two portable computers using flash memory rather than hard disks. Right now that means there'll be a significant premium for these quieter, faster, more shock-resistant (and cooler?) machines, but, like Grass Valley's flash-based camcorder, this is most interesting as an indicator of future tech. How long before our hard disk-based 40 GB digital audio players seem clunky and old-fashioned? Dan's Thoughts: Derik mentioned Samsung's hybrid flash/magnetic storage drives last week, but these will run on purely flash memory hard drives. It will be interesting to see if these catch on; they certainly entice us with the promise of small, power-efficient notebooks.